Lindsay Transport’s fleet quality and efficiency manager Nick Lindsay (left) with Bridgestone Australia general manager of commercial Claudio Sodano. 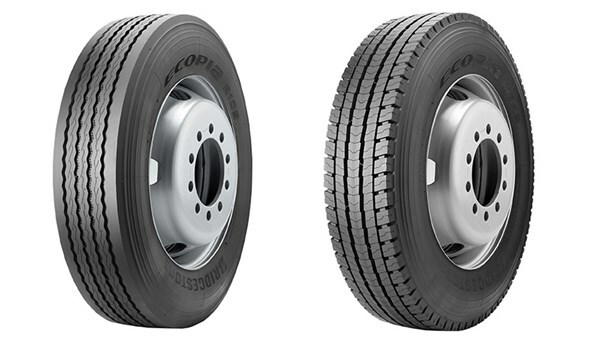 Bridgestone Australia has unveiled four new sizes in its heavy vehicle Ecopia tyre range, covering both drive and trailer applications. Upping its availability to 90 per cent of the drive market and 95 per cent of the trailer market, the manufacturer now offers a 275/70R22.5 M749 drive tyre and 265/70R19.5, 275/70R22.5, and 255/70R22.5 R109 trailer tyres. 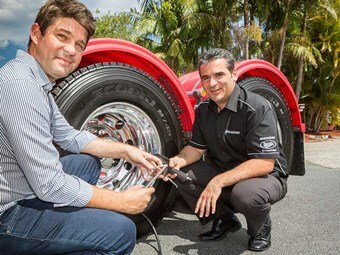 Bridgestone Australia and New Zealand managing director Andrew Moffatt says the Ecopia range has been tested to ensure fuel savings. "Our in-fleet testing across Australia means Ecopia has well and truly been put to the test since its launch in 2013," Moffatt says. "The key factor here is that we are consistently seeing fuel savings of up to six per cent." This reduction is beneficial to both operators and the environment, he says. "It is now a business imperative for operators in the trucking industry to lower their emissions and improve their green credentials," Moffatt says. "Our Ecopia low rolling resistance drive and trailer tyres provide a very real way for operators to achieve this goal and we’ve been seeing an increasing amount of interest in Bridgestone Ecopia as a result." One of those who have switched is Lindsay Transport, with Bridgestone Australia fitting the trucking operator’s entire fleet with the low rolling resistance Ecopia tyres. A deal struck after a trial period, the move is predicted to save the hauler 6,000 tonnes each year in CO2 emissions – equivalent to removing 18 B-Doubles from the road. Lindsay Transport’s fleet quality and efficiency manager Nick Lindsay says the benefits are "incredibly exciting." "In today’s competitive market, this environmental commitment is an important benefit we can offer our customers – many of whom are looking to strengthen their own green credentials," Lindsay says. "Beyond that, we believe we have a responsibility to give something back to the community and this is a meaningful way for us to do that." Bridgestone Ecopia R109 (left) and the Bridgestone Ecopia M749.